Most anglers like nothing better than to show off their lure collection and generally it is an eclectic mixture of lure types and colours. Collections are very personal and most of the lures were purchased for a specific species or reason. However, irrespective of how many lures an angler owns, it is likely that the great majority never get used and when they occasionally do get attached to the end of a line it is likely an act of desperation. Anglers tend to stick with the tried and trusted and cycle through several in a session, only experimenting if things don’t go to plan. I’ve often wondered what would happen if I only used a single lure for 12 months. Would my catch rates drop or increase? How would I cope when the fishing inevitably got difficult? Would I be forced, out of necessity, to start to experiment with casting angles, retrieve speeds, cadence and depth in order to avoid blanking? The highest rate of success was achieved when no more than two lures were used in a session. The more lures trialled per session the lower the overall rate of success. So last March I decided to run a 12 month experiment using a single lure. I opted to use a 10 cm Kilwell Toby (unrigged 6 cm). See the image above. The main reason being that they are proven fish catchers, cast a long way and sink erratically so it is possible to cover the entire water column with a single lure type. The colour scheme I selected was the Emperor as I had developed a high level of confidence in it. I purchased two lure weights, namely a 10 gram and 15 gram. Physically both weights had the same body size but the heavier lure is formed from a thicker metal blank. The 10 gram lure was my “go to” and I only changed up in weight if fishing into deep water or casting into a head wind. 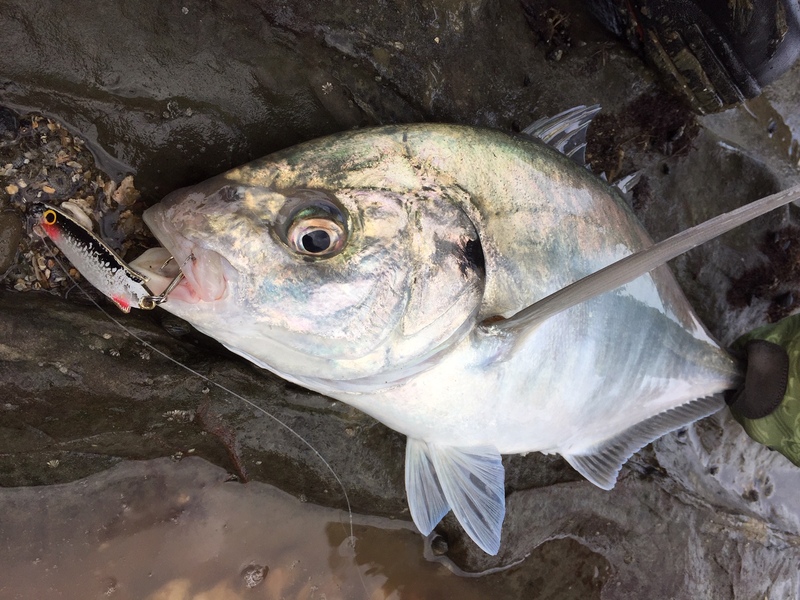 Over the course of the 12 month period I fished the flats in five separate harbours namely the Manukau, Waitemata, Whangamata, Aotea and Tauranga. I fished for around 1.5 – 2 hours per session as this mirrored what I’d been doing for the last 15 years. This also allowed me to statistically compare catch data. The year started off well with a large number of autumn kahawai succumbing to the Toby. 50% of the kahawai were over 1.5 kilograms which represented more big fish than ever before. Was this due to the lure choice? I even managed to catch several decent trevally and a Yellow eyed mullet for variety. As expected, things got slightly leaner in the early winter but by casting more upstream, slowing the retrieve and counting down the lure I managed to lift catch figures. Almost all of the fish landed in the cooler months were kahawai . Spring and summer can be tough on the northern flats as the bigger kahawai largely move out and are replaced by snapper. This year it was no different and I was forced to change tactics significantly to avoid regularly blanking. The key thing was to focus on the cleaner water and get as deep as possible. Increasing retrieve speeds helped as the water progressively warmed. 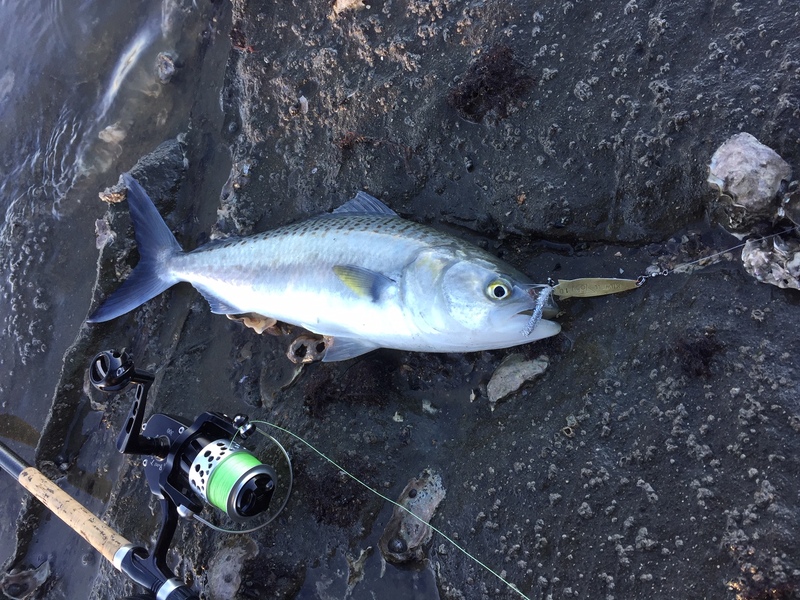 As the summer wore on I started to see kingfish marauding the flats and even managed to connect with a couple, even though the lure was comparatively small. 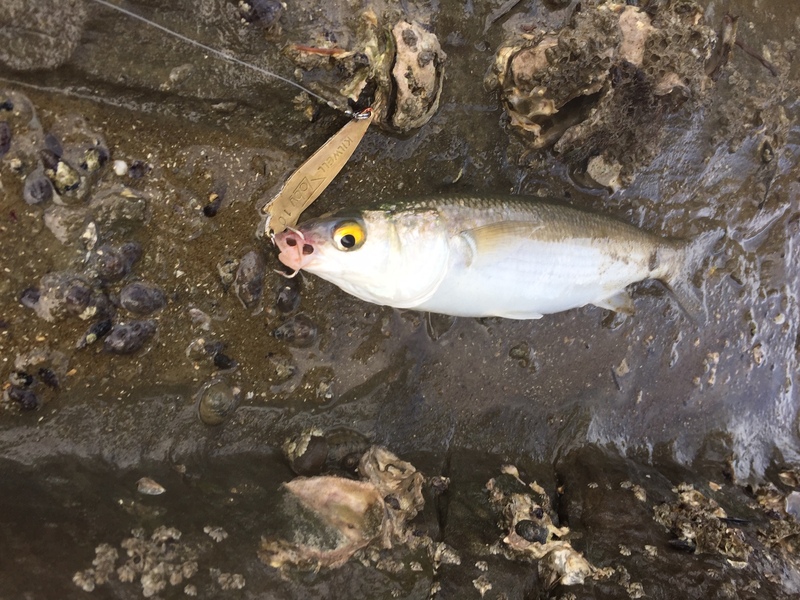 Unfortunately, due to the terrain that I was fishing, the kingfish found foul before I could turn them but it was fascinating to see that they’d nail such a small lure. Snapper did not feature in the catch data for the entire year but I have caught them on a Toby in the surf before so it is possible. They were definitely around though as I caught them on a fly when the conditions suited. I’m picking that the lure was tracking too high and the retrieve rate not irregular enough to tempt snapper as they are used to feeding on injured baitfish. Obviously a work on. My feeling is that if I switched to a more erratic “lift and drop” retrieve with lots of pauses then snapper would start to feature. When I compared the 2018-9 catch data with my lure fishing only sessions over the previous six years I was staggered to discover that my catch rate dropped from 43 minutes per fish to 23 minutes per fish when using a single lure. This is a massive drop and it is statistically significant at the 95% confidence interval. In my wildest dreams I didn’t expect that the results would be so conclusive. The six year period that was used as a reference was very representative and included several good years and a couple of less successful years. Slow, steady retrieves work best when the water is cool and murky. This is probably because fish use their lateral line to locate distressed prey and by slowing down the retrieve you increase the chances of them finding and intersecting the lure. Casting upstream and retrieving the lure towards you, especially if fish are holding hard up against an underwater sand bar and you can move the lure across and in front of their position, can be deadly. Allowing the lure to sink by “counting down” before retrieving in deeper holes is a great way to find where the fish are holding on a tough day. I count down in five second intervals and in the shallow water I fish 20 – 25 seconds is enough for the lure to reach the bottom. If the fish are feeding on the surface then retrieving the Toby quickly so that it skitters across the surface can be deadly and incredibly exciting. Just like retrieving a popper. Watching the vibration of the rod tip is an excellent way to gauge retrieve speed. I always start at maximum vibration as this is when the lure action is optimised and move away from there. I attached single hooks with skirts to a couple of lures to provide some variation. These also worked well but the hook up rate tended to drop off so mostly I used treble hooks with flattened barbs. I’m fairly confident that on the rare days when I blanked nothing would have worked. The reason I mention this is that I did have a few casts at the end of a difficult session with another lure type (e.g. soft plastic) to see if it worked and it never did. I also tried a few casts with other lures when the fish were taking the Toby and while I did catch fish the results were inconsistent. I have no doubt that the results of this experiment would hold true if other lure types were used. The key point is to use a lure that you have confidence in and experiment to learn how to use it properly. 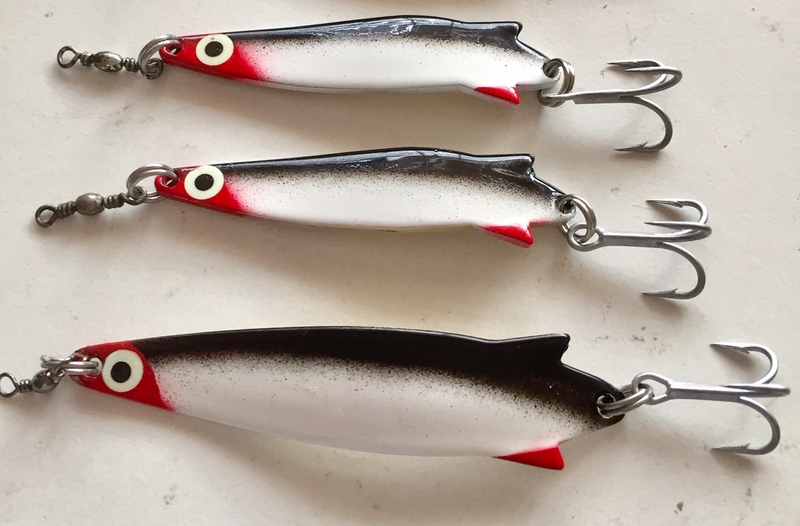 I’m not saying ditch all of the lures in your collection, just learn how to use each of them and start varying retrieves if things are slow rather than changing lures. Excellent reading Alan. Some very well thought out ideas that have obviously paid dividends for you. Brilliant stuff, thank you for the info and work put in. Will give this a go here in UK. Thanks for the kind words Martin. Tight lines. Alan. Great read thanks for your observations, makes me also think when i was a kid i fished that one toby i had so many diffrent ways and lies for the Salmon and caught.. Thanks for the kind words Tam. Sometimes the simple stuff just works. Really interesting read. I’d been thinking ood doing this with a surface lure (Patchinko) because you can also vary the hooks on it (remove tail hooks, or replace with singles) to give a different action. Thanks for the kind words Chris. Sounds like a good plan.